PDigong signed the DOLE-DTI sponsored EO which was rejected by Nagkaisa! months back. We felt we were taken for a ride. There was no consultation with our 5th draft submitted to the Office of the President thru the Labor Secretary last April 13. The EO that was signed definitely is an EO for the employers not for the workers. We will not waver, we will continue to fight to give justice to workers affected by the widespread contractualization of labor. 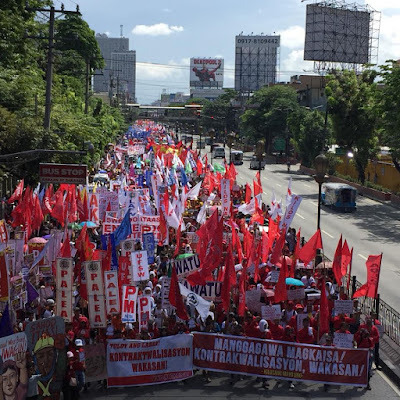 If PDigong wanted to fulfill his promise of ending endo he should have signed the 5th draft of the workers’ EO that would make direct hiring of workers to principal employers a norm in employment relations of his administration but on the other hand would open some jobs or functions to labor contracting subject to consultations in the National Tripartite Industrial Peace Council. Instead PDigong broke his promise and betrayed the workers.